"Moraga instantly adds color and flair to your bedroom. 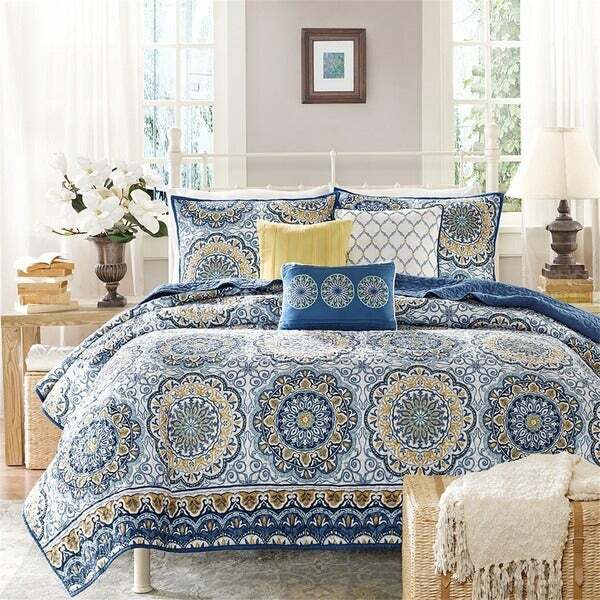 Its bold blue and yellow floral print with large medallions is a modern twist to a classic look. The embroidered detailing on the three decorative pillows pulls the whole look together. 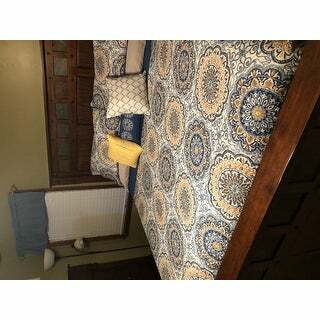 This coverlet set also includes two matching shams. With a microfiber polyester face and a brushed fabric reverse, this coverlet is soft to the touch and machine washable for easy care. Materials: Coverlet & Sham: 100% Microfiber printed with all over quilting, 100% polyester brushed fabric back, 200g/m2 cotton fill. The Madison Park Moraga 6-piece Coverlet Set is just beautiful. The colors were true. We had just had our bedroom painted a soft yellow and the set looks just perfect. The set does need a bedskirt. After carefully measuring what we needed for length of the bedskirt, we determined that 14 inches was the maximum length. Therefore, we had to find one that size rather than the common 15 inch length. We found a 14 inch one in navy blue and it is just perfect. Love this set. Beautiful colors. Stitching is well done and I think it will be pretty durable even in a house full of pets that I cant keep off the bed. Fits nicely into my washing machine and comes out of dryer without wrinkles. I have washed it numerous times alreasy and it shows no signs of wear. Would definitely purchase this brand again. Perfect addition to bedroom makeover. Love it ! This bedding outfit is perfect! It matches the yellow and blue slipper chair I recently bought from Overstock. Funny, I never cared for yellow or blue and now love them. My tastes for vintage, cottage style and antiques has never changed since I was young. My parents were lover's of history and dusty old shops full of wondrous things that each had their own story to tell. I tagged along most weekends and developed a love for all things old and unique. My parents are long gone and I will be 64 next month, but my love of these things have never changed. I haven't been in a mall since I was in my 20's. I was diagnosed in my 30's with a genetic degenerative disease. They told me I would be in a wheel chair by 50. Well I just moved from cane to walker, but it doesn't mean my loves have changed. My house is full of eclectic items from my many travels and unique items or "trash" as my friends would call them that my Father &amp; I turned into beautiful pieces. Overstock has been my saviour with unique items to add to my home. Not quite into making my own sheets, comforters, chairs etc. My family totally surprised me by redoing my bedroom, which is large 18x12, by taking it down to the studs and putting head board on three walls and painting an 18 ft wall, Lemon Pound Cake Yellow. It is beautiful. My bed is a high post 200 yr old wrought iron cream colored bed. I knew exactly where to go to find some new items to finish the makeover. I bought the beautiful, unbelievably comfortable slipper chair and the gorgeous, soft coverlet, shams and decorative pillows that matched perfectly. I knew Overstock would be my go to place for all kinds of looks and styles. I also bought two painted dipped small tray tables that reminded me of the 1950's. One blue and one yellow. My room is gorgeous and relaxing which is fantastic, since I spend most of my time in here. I am working on setting up a small sitting area. As soon as I can save some more money I will be back to complete that corner of my world. Overstock I cannot thank you enough. My world may have grown much smaller, but with all the wonderful items you have to choose from and great prices, I can still make my little part of the world a comfortable and enriching environment. Thank you! This is a really pretty Set and it is nice and soft. Problem is it is just not wide enough for a kingsize bed with a tall mattress. I had to order a bedskirt to use with it which I don't like to use because they just catch pet hair. With thick mattresses being the norm now, I don't understand why bedding mfgs don't make spreads just 5 inches wider to accomodate them. I love this set!! The coverlet is light weight and good for summer. Warmer than other coverlets I've had. Great colors. I was afraid it might be too busy, but it looks great in our neutral room. The fabric is really soft. It ALMOST feels like microfiber. The three accent pillows are great. There are 4 or 5 shades of blue in this coverlet, so most any blue will work if you are trying to match other furniture. REALLY happy we got this. This is a stunning set. Just beautiful! Colors are true to the picture. The quilt actually fits a queen bed. I have wood rails on the bed and the quilt hangs about 1/2 way over them. The fabric is thick, yet a soft, lightweight microfiblber. The quilt and shams are very well made and are quilted nvery tightly. The three accent pillos are of good quality and are embroidered. Stunning! I bought a king size coverlet for a queen bed and it hangs about 3-4 inches off the floor. Perfect length without a bed skirt. It is vibrant and beautiful on my new guest bed. The shams are king size so I put 2 king pillows in them and it looks fine even on a queen bed!. Coverlet is soft and nice enough that it can double as a light blanket. We saw a similar quilt coverlet at another store for 3x the price. We use the coverlet as a throw on our bed over a duvet with down comforter. The colors are just as pictured and gorgeous. The quality is nice. Very pleased. The colors are beautiful! And it's long enough on the sides. I highly recommend this coverlet. Just what I have been looking for. Looked for a long time and I just love the comforter. I received my purchase about a week after transaction. The colors are not muted as shown. They are bright and beautiful. I will be purchasing another one soon! I ordered this because I loved the colors. AWhen I received it I was even happier than I thought I would be. the colors are vibrant and fill the bedroom with life- a much needed facelift. Accompanying pillows are attractive as well. Will enjoy this for years to come. Thanks for the great product, easy ordering and great delivery. Bought this 2 years ago and it is still on my bed to this day! As thin as paper. Barely covered the bed. Looks cheap! Lt. Weight and classic looking. worth the money. and very attractive for an antiguey look. Good quality. Colors are beautiful. Nice set! I just received this and wow! am I in love! The colors are vibrant and really brightens up the bedroom. I read other reviews and read that it was light weight, which is what I wanted...it's a great Spring/Summer comforter/quilt. Great pictures but fabric and design look very cheap at home. I love these sets! I use them in my vacation rentals and they hold up to a lot of washing and dry quickly. They are pretty and don’t fade or wrinkle. "DOES THE KING FIT A KING BED WELL. HOW MUCH DOES IT HANG OVER THE SIDES"
The Coverlet fits the King bed well. There is about 14-15 over hang on each side. An entire row of the design hangs over. We have received many compliments form guest. I love the king on my queen size bed. It does not look out of place at all. i ordered the queen first then returned it for the king. Not too big at all! Just right! "Do you have curtains that match this coverlet set? Preferably blackout curtains." I bought the fabric shower curtains and hemmed the top to fit on a curtain rod. They are not blackout, but for me they do the job of giving privacy. I bought the matching fabric shower curtains and hemmed them for regular curtains. They are not blackout and work well for privacy. "Can i get king size pulliw shames"
Two king sized pillow shams come with the 6-piece set. The king size comes with King sized shams. "Is there any black in it?" no just royal blue , yellow and white . very beautiful ! No black at all in this pattern. "Is there any chemical odor, especially that might remain even after a washing? I seem (overly?) sensitive to formaldehyde that is commonly used in manufacturing in imported bedding. I love the look of this, I think it would be perfect in my room." I did not find there to be any chemical order. I have two of these quilts and love them. And no I have not discerned any odor at all. "what kind of "hand" does this have? I know it is poly, but does it feel slippery like poly can sometimes, or does it have more of a cotton feel?" No it does not feel slippery and it makes up beautifully. It drapes and hangs very well and stays in place. Doesn't feel slippery to me. "What bed skirt would match this quilt?" I used a white bed skirt. That way I could reverse to the solid blue if I wanted to. Mine is the tailored style as opposed to the ruffled. Looks nice. I used a yellow it looks great.